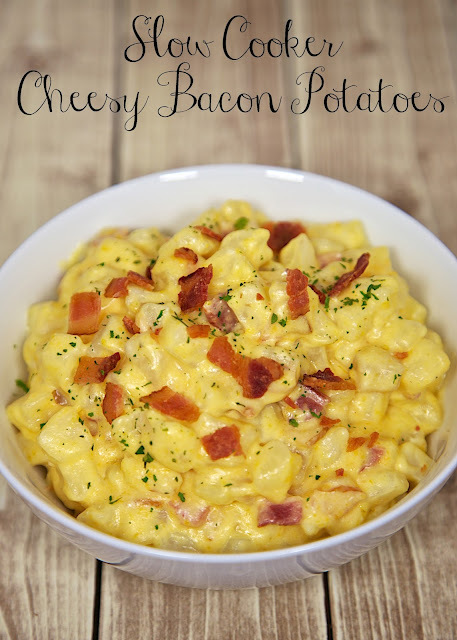 Slow Cooker Cheesy Bacon Potatoes Recipe - frozen hash browns, cheese, bacon slow cook all day for a delicious side dish! We love to make potato casseroles. 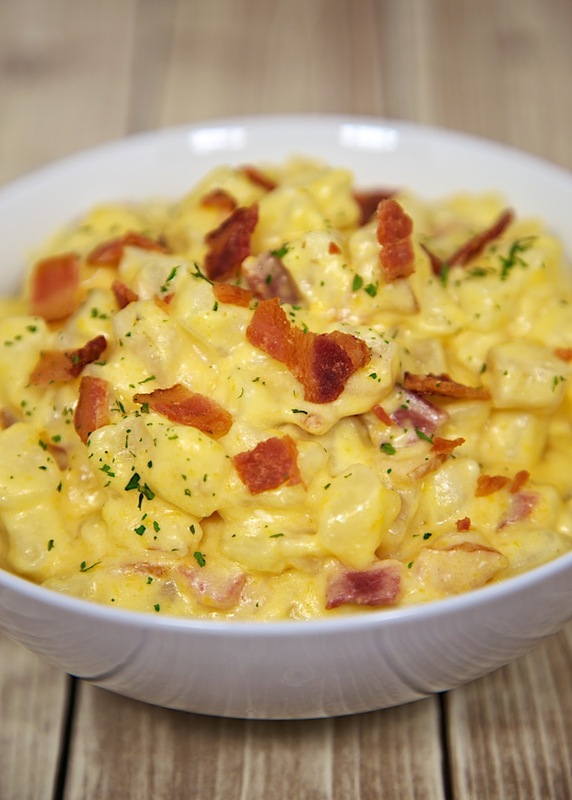 We always have one in the freezer for a quick side dish. A lot of people ask if the potato casseroles can be cooked in the slow cooker. I had never given that cooking method a try. I decided to experiment with it and see how the potatoes turned out. I used the chunked frozen hash browns in this recipe, but the shredded should work fine too. I mixed everything in the slow cooker and set it to LOW. How were they? Amazing! They were so creamy and cheesy. We loved them! I loved how easy they were to make. We will definitely use this recipe again! In a 6-qt slow cooker, combine all ingredients and stir to combine. A few years ago I came across the most delicious cheesy potatoes I had ever eaten. I asked for the recipe and it was the same as I had always made (and the recipe you provide above), except french onion dip was substituted for the sour cream. The flavor was out of this world! I will definitely be trying my next batch this way, in the slow cooker, and can't wait to see how the addition of the bacon lends to the already delicious flavor. Thanks! I love using French Onion Dip in casseroles! I am making the French Onion potato casserole this weekend. It is so yummy. I bet it wold work great in this recipe too. Okay, I think I really need a slow cooker now! This looks so good! I think that would be fine! Enjoy! I think it would work perfectly. Enjoy! !